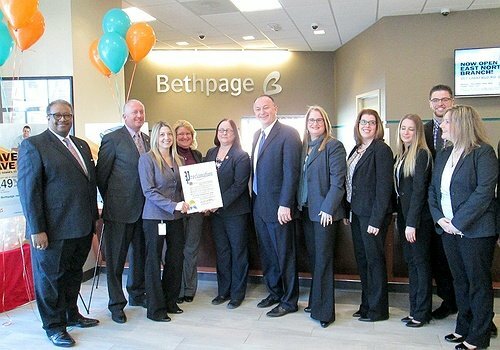 Suffolk County Legislator Robert Trotta attended the grand opening of the thirty-third branch of Bethpage Federal Credit Union (BFCU) on Larkfield Road in East Northport. Smithtown, NY - March 13, 2015 - Suffolk County Legislator Robert Trotta attended the grand opening of the thirty-third branch of Bethpage Federal Credit Union (BFCU) on Larkfield Road in East Northport. Executives from the credit union, officials from the East Northport Chamber of Commerce, and Huntington Councilwoman Susan Berland joined Legislator Trotta in welcoming BFCU to the area. Legislator Trotta presented the branch manager with a proclamation and thanked them for selecting East Northport for their new location and for being an active and supportive business member in the community. Pictured at the grand opening are from left to right Vernon Williams, VP Branch Operations, Wayne N. Grosse, President and CEO of BFCU, Lori Malley, East Northport Branch Manager, BFCU staff, Suffolk County Legislator Robert Trotta, Huntington Councilwoman Susan Berland, and BFCU employees. Legislator Trotta serves on the Legislature’s Budget & Finance, Education & Information Technology, Health and the Humans Services and Ways & Means Committees. Subject: LongIsland.com - Your Name sent you Article details of "Suffolk County Legislator Robert Trotta Welcomes Bethpage Federal Credit Union to East Northport"